The hair follicle growth cycle consists of three phases: a growth phase (“anagen”), a transitional phase (“catagen”), and a resting phase (“telogen”). In susceptible hair follicles, the hormone dihydrotestosterone (DHT) can, over time, cause the growth phase of the hair cycle to become progressively shorter. As a result, the individual hairs produced by these follicles decrease in size (diameter and length) until they eventually disappear. 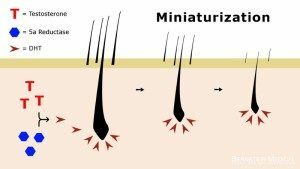 This process is called “miniaturization.” It is the main mechanism in androgenetic alopecia(genetic balding). 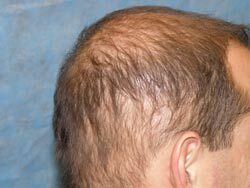 In the following patient, we see a close-up of the side of his scalp where the hair is not affected by DHT. We see mostly groups of full thickness hairs (called terminal hairs) and a few scattered, fine vellous hairs, normally seen in a donor area. The pointer (left) indicates the location on the scalp in the close-up view. 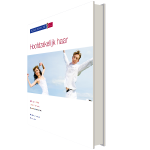 Minituralisatie door DHT bij haaruitval (Engels) 10 HAARUITVAL FABELS Leuke dia’s en video’s over haaruitval. 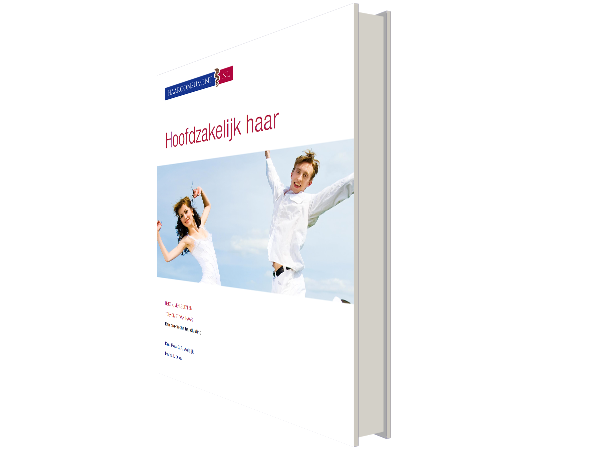 (Engels) Hoop voor Alopecia Areata patiënten? 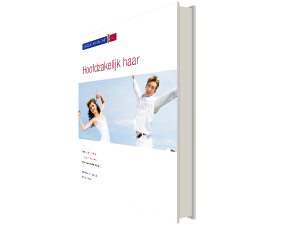 Speciaal nieuwsbericht.